Scott has a long track record of being underestimated. As a player who never got full playing time until the advanced age of 27, he’s been given short shrift again and again. But last season, Scott showed impressive power for the fourth consecutive season. One of the streakiest batters alive, Scott tore it up this season to the tune of 27 HR, a feat that’s particularly noteworthy given that homers were down MLB, and that Scott played in just 131 games. The Orioles had O-so-many disappointments in 2010. Matt Wieters hasn’t yet fulfilled the expectations that he might be Mark Teixeira with a catcher’s mitt. Adam Jones looked to be a budding superstar at the start of 2009, but has since taken a few steps back with his inability to take a walk. Brian Roberts was injured much of the season. And whatever happened to Nolan Reimold? Still, the closely contested award for biggest disappointment on the team has to go to Markakis, who hit just 12 HR in 2010, with just 60 RBI. As we just discussed, Wieters hasn’t yet fulfilled his promise. But he hasn’t played two full seasons in the big leagues yet either. A catcher with 35 HR potential just doesn’t come along very often. So we’ll give Wieters a pass, hoping that the 24-year-old may be on the verge of a breakout year. A couple more words on Markakis as we look to next season. On the bright side, Markakis suffered from a woeful 6.1% HR-to-FB ratio, perhaps an indication that we could see a return to 20-plus homers next season. His BABIP was .331 last season, which indicates luck, but a deeper look reveals his strikeout rate went down and his walk rate went up. In other words, his sub-.300 average languished largely as a result of not getting the ball out of the park with higher frequency, as his flyballs found more gloves. For more on the Baltimore Orioles, check out Bloomberg Sports’ Fantasy Tools. 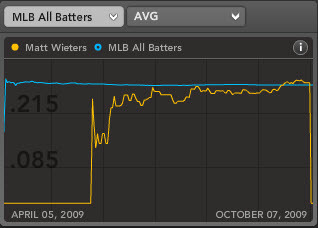 To say Matt Wieters may have been a tad bit overhyped is more than fair at this point in the catcher’s career. Through the first 637 plate appearance of his career, Wieters slash line is a paltry .264/.322/.384. For the sake of comparison, Jason Kendall’s career line is .289/.367/.380. That’s counting some excellent seasons earlier in his career…but, still. Everything about Wieters screams that he should be performing better than last year. His walk rate has increased nearly a full percentage point (from 7.3% to 8.1%), his strikeouts have declined (from 24.3% to 22.9%), and his ISO (slugging percentage minus batting average, an indicator of power hitting) has remained nearly the same (.124 to .115). The elephant in the elevator is Wieters’ batting average on balls in play and batted ball profile. He’s hitting more groundballs than last year (roughly 5% more; or 47% total) and yet his BABIP has dropped nearly .100 points, to less .269 (league average is typically around .300). Generally, putting the ball on the ground means more singles and fewer extra-base hits. Yet, that doesn’t always hold true when the batter isn’t fast enough to beat out close plays for infield hits. Wieters has all of four career infield hits; that lack of speed, combined with an unhealthy dose of poor luck, have been the culprits. The reality of the situation is that Wieters’ hype has caused fantasy owners to hold on a little longer than they should. In keeper leagues, he’s well worth a hold. But standard 12-team mixed league owners can probably find better options elsewhere. To name two: Angels’ catcher Mike Napoli’s already reached double-digit home runs, and Miguel Montero recently returned for the Diamondbacks and is mashing, while hitting in the middle of the Arizona lineup. For more on Matt Wieters and other catchers, check out Bloomberg Sports’ Fantasy Tools. Bloomberg’s Demand vs. Scarcity chart does a great job of illustrating this. If you are not fortunate enough to land one of the elite backstops, selecting a catcher can be a difficult process. With that in mind, keep an eye on these names when selecting your 2010 fantasy catcher. When Diamondbacks’ starting catcher Chris Snyder went down with a back injury last summer, Miguel Montero made the most of his Wally Pipp opportunity. For the first time in his four-year career, Montero was given more 400 at-bats. He responded by hitting .294/.355/.478 (AVG/OBP/SLG) with 16 home runs and 59 RBI. His .327 batting average on balls in play (BABIP) was above the expected norm (around.300), but Montero has sustained a BABIP over .320 in each of the past two seasons. Even if his batting average regresses to the .275 area, his power numbers pass the test. Montero’s .184 ISO (slugging percentage minus batting average) was within his career average of .178 and his 12.7% home run-to-fly ball ratio (HR/FB) wasn’t far from his career number, 11.3%. Montero goes into 2010 as the clear-cut starter for the Diamondbacks and could top 500 at-bats if Arizona can find a trade partner for Snyder. Another season with 15 to 20 home runs is well within reach. Like Montero, Chris Iannetta enters 2010 as his team’s clear number-one catcher, after being mired in a time-share for several seasons. The Rockies did sign Miguel Olivo to replace Yorvit Torrealba, but Iannetta received a three-year extension from Colorado, showing that he is the team’s first choice. Iannetta hit just .228 last season. That was actually an improvement over his .218 mark in 2008, though still a huge drag on his fantasy value. Iannetta’s batting average on balls was just .245 in ’09 though, well below his .283 career mark and the league-wide of just over .300. Despite the low batting average, his selective batting eye led to a healthy .344 OBP. Unlike his new teammate Olivo, Iannetta will take a walk. He walked 12.3% of the time last season, while Olivo took a free pass just 4.6% of the time. In addition to getting on base, Iannetta has shown excellent power from the catcher position, his ISO topping .230 in each of the past two seasons. In 2009, his HR/FB of 14.0% matched his career number. Playing his home games in Coors field is an added bonus, but Iannetta’s home/road power splits show some balance: His home slugging percentage sits at .466, vs. .427 on the road. The low batting average and BABIP make Iannetta a bounceback candidate in 2010. His impressive power from the catcher position makes him a good buy-low candidate in the late rounds of a mixed-league draft. Matt Wieters is no stranger to hype. That hype fizzled a bit when he got off to a slow start in 2009, though. During the first half of the season, he hit just .259/.316/.407 in 117 plate appearances. As his playing time increased during the second half, so did his production. Over the final 65 games of the season he hit .301/.351/.415 in 268 PA. This included a monster final month of the season, where he crushed the ball at a .333/.395/.486 clip. Wieters’ .356 BABIP last season is likely to regress toward the .300 level. But the Orioles catcher can make up for it in other areas: He walked just 7.3% of the time while striking out 24.3% last season, numbers that are likely to improve given his superior minor league walk rate (14.7%) and strikeout rate (18.3%). Wieters is not a true “sleeper” with an ADP of 96.5; however, that is 49 spots later than McCann, 72 spots later than Martinez, and 85 spots behind Mauer. Not yet in that upper echelon of backstops, Wieters’ late-season charge could portend a big season, turning the top catching trio into a fantastic four. 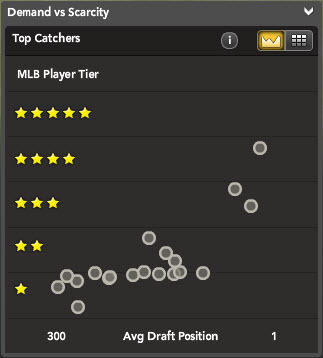 For more info on major league catchers including: player cards, position rankings, average draft positions, and more, check out Bloomberg Sports’ fantasy kits.